Airtel good data offers have always been sim selective… even the 4G LTE service is state selective which I’m not too impress about. Buy you might be lucky for Airtel 1.8GB offer. The offer below is not new but has always been updated regularly. Airtel NG is offering you a whopping 1.8GB for N500 to last you for 14 days. According to their text as seen below, the offer will be available for 6 months. But if you didn’t receive the message above, dial *418*2# to know if you are eligible or not. This offer works on all devices but available to only circumcised sims. The validity period for this offer is 30 days. Dial *440*161# to know if you are eligible. When ntel is giving 500% bonus. I’m not even interested. I don’t even know were I kept my airtel sim. I got just 750 MB. I am eligible for the 1.5gb own not 1.8. Good day, prof I checked with the code and was told I do not have sufficient fund, and on recharging and dialing the code again 750 MB was given me. I think it is a ruse from Airtel to get you to gift them your 500 like I just did. Oshe! I got same ussd reply. I almost recharged but for this your comment, I give up. Most useful comment I’ve read on this blog this year. 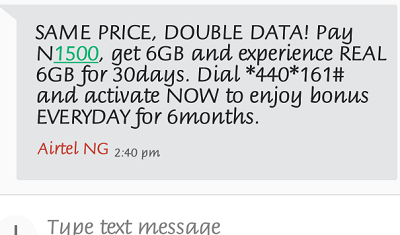 Airtel deceiving people since 1900. We are not doing! Airtel just zapped the data overnight.